Not so much big news at Eurobike this year if you ask me. 10,000 electric bikes (9,997 of them ugly), in general very nice (mostly understated) graphics and lots of 650B mountain bike wheels and bikes “because we don’t really like it but we don’t want to miss the boat”. Syntace showed a really clever solution to having a quick release on their X-12 thru-axle. 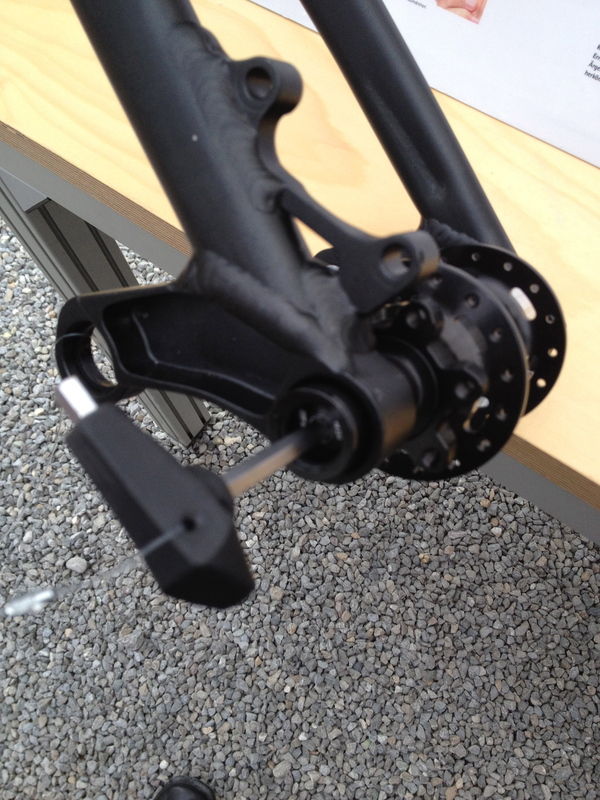 Instead of having a quick release lever both fornt and rear, they have a small allen key that stores inside the axle when not used. It locks in tightly, so you won’t lose it during your ride, and when you need it you simply pull it out and use it for your front or rear axle. Or for our seattube collar or any other bolt on your frame of that size. It’s quite light (around 30g) with a very clean design. Brilliant. Rotor has big news with a new aero crank (the Flow) and a new power-measuring crank (which measures both sides, pull and push, also very nice). But the little news was cool too. 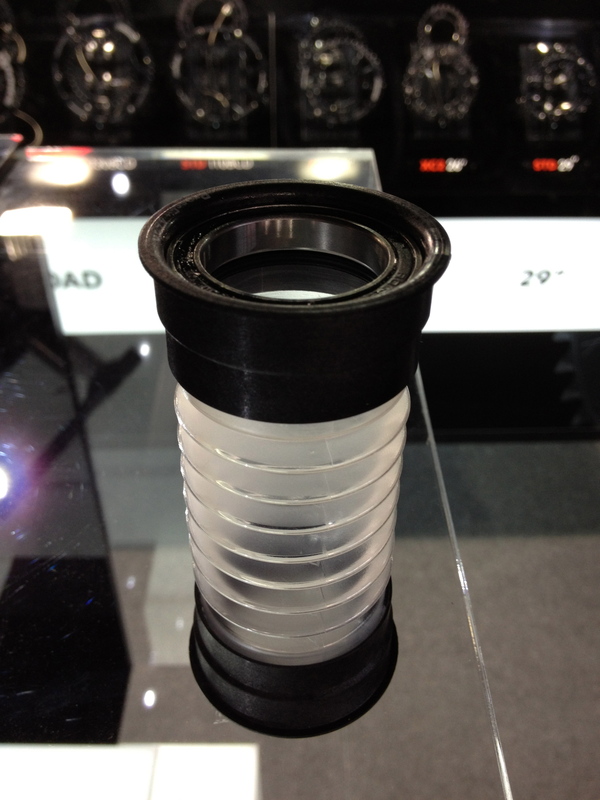 With so many bottom bracket standards, press fit bearings come with sleeves in a gazillion widths. That means that when you need a replacement, chances are your store doesn’t have the right one. Rotor now offers a one-size-fits-all solution, with a harmonica design. Very clever. That’s it for now, too many meetings here at Eurobike to write too much. Enjoy the weekend. This entry was posted on	August 31, 2012 at 14:30	and is filed under bike equipment. I think that’s an accordion, not a harmonica. Any pictures of the Open bikes at Eurobike? And can we buy one of those cool fluor yellow Open t-shirts yet? Hi Allen, our retailers in France, Finland and Portugal have purchased all our T-shirt stock. Not sure if you live in any of those countries? Anyway, we will make a new batch of T-shirts and we’ll focus on those green (they’re not yellow) ones. However, I may still have a few left in my secret stash. What size are you? If I remember there was a photo of you wearing a fluro yellow one and it looked great. It was a lousy photo, the shirt was lime green. Anyway, I’ll check next week on the sizes I have left, if any. Definitely accordion! But a fine idea and design; a one-size-fits-all is something BB genuinely needs. The industry is generally dismissive when talking about 650B amongst themselves, but to the outside world they all feign excitement. I think there are applications where 650B makes some sense, but it’s definitely not a “combining all advantages of 26″ and 29″ wheel” matter. It’s half of one and half of the other. Jan Heine’s been arguing for 650B for road bikes for years: same rolling diameter with fatter tires. It makes sense to me. At some point there’s an optimum which balances big+cumbersome versus smoother rolling. In the end, 26″ tires are still winning a lot of the biggest races, especially if you discount the Specialized Epic, so it seems evident that a 5% or 10% change in wheel size isn’t such a very big deal. Well, winning races is a measure of what companies want to market, not of what is faster and certainly not of what would work best for most riders. At any rate, a smaller wheel with a bigger tire will feel more cumbersome than a bigger wheel with a smaller that has the same rolling diameter. The tire is a lot bigger factor in the weight, so bigger tire means heavier, and all on the outside of the wheel where it counts more. Anyway, the differences are definitely noticeable for normal riders, but not enough to start a religious war over. Gerard, you are approaching the 650b wheel size from a racer/xc rider perspective. It’s use will have a bigger impact in the longer travel full suspension market where the sheer size of a 29″ wheel with big tires makes frame design a compromise. My personal opinion is that it has some useful application but it is not a miracle solution. It doesn’t combine all the advantages of 26″ with all the advantages of 29″. It’s in-between and combines half the pros and cons of both. And it’s not earth-shattering; a 26″ wheel with a fat tire is almost as big as a 650B with a skinnier tire.